The narrative of Bel and the Dragon is incorporated as chapter 14 of the extended Book of Daniel. The text exists only in Greek (while the oldest copies of the Book of Daniel are entirely in Hebrew and Aramaic). The original Septuagint text survives in a single manuscript, Codex Chisianus, while the standard text is due to Theodotion, the 2nd-century AD revisor. This chapter, along with chapter 13, is considered deuterocanonical: it was rejected by Rabbinic Judaism, and while it is viewed as canonical by both Catholic and Orthodox Christians, it is considered apocryphal by Protestants and typically not found in modern Protestant Bibles. The work may date to the Persian period. The chapter contains a single story that may previously have represented three separate narratives, which place Daniel at the court of Cyrus, king of the Persians: "When King Astyages was laid to rest with his ancestors, Cyrus the Persian succeeded to his kingdom." There Daniel "was a companion of the king, and was the most honored of all his Friends" (14:1). The narrative of Bel (14:1–22) ridicules the worship of idols. In it, the king asks Daniel, "Thinkest thou not that Bel is a living god? seest thou not how much he eateth and drinketh every day?" to which Daniel answers that the idol is made of clay covered by bronze and thus cannot eat or drink. Enraged, the king then demands that the seventy priests of Bel show him who consumes the offerings made to the idol. The priests then challenge the king to set the offerings as usual (which were "twelve great measures of fine flour, and forty sheep, and six vessels of wine") and then seal the entrance to the temple with his ring: if Bel does not consume the offerings, the priests are to be sentenced to death; otherwise, Daniel is to be killed. Daniel then uncovers the ruse (by scattering ashes over the floor of the temple in the presence of the king after the priests have left) and shows that the "sacred" meal of Bel is actually consumed at night by the priests and their wives and children, who enter through a secret door when the temple's doors are sealed. The next morning, Daniel calls attention to the footprints on the temple floor; the priests of Bel are then arrested and, confessing their deed, reveal the secret passage that they used to sneak inside the temple. 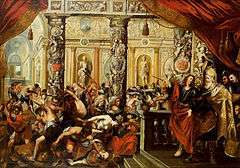 They, their wives and children are put to death, and Daniel is permitted to destroy the idol of Bel and the temple. This version has been cited as an ancestor of the "locked room mystery". In the brief but autonomous companion narrative of the dragon (14:23–30), "there was a great Dragon, which they of Babylon worshiped." In this case the supposed god is no idol, but an animal. However, Daniel slays the dragon by baking pitch, fat, and hair (trichas) to make cakes (mazas, barley-cakes, but translated "lumps") that cause the dragon to burst open upon consumption. In other variants, other ingredients serve the purpose: in a form known to the Midrash, straw was fed in which nails were hidden, or skins of camels were filled with hot coals, or in the Alexander cycle of Romances it was Alexander the Great who overcame the dragon by feeding it poison and tar. The parallel with the contest between Marduk and Tiamat, in which winds (sâru) controlled by Marduk burst Tiamat open, has been noted by many informed readers; barley-cake plays the same role as the wind. As a result, the Babylonians are indignant. "The king has become a Jew; he has destroyed Bel, and killed the dragon, and slaughtered the priests," they say, and demand that Daniel be handed over to them. The third narrative (14:31–42), Daniel in the Lions' Den, may be a retelling of Daniel's first trip from (6:1-28) or may describe a separate incident. It has been made into a consequence of the preceding episode, but the Septuagint precedes it with the notice, "From the prophecy of Habakkuk, son of Joshua, of the tribe of Levi." Daniel remains unharmed in the den with seven lions, fed by the prophet Habakkuk, who was taken to the lion's den by an angel. "Upon the seventh day the king went to bewail Daniel: and when he came to the den, he looked in, and behold, Daniel was sitting. Then cried the king with a loud voice, saying, Great art thou, O Lord God of Daniel, and there is none other besides thee. And he drew him out: and cast those that were the cause of his destruction into the den: and they were devoured in a moment before his face." ↑ Levine 2010 : 1552. ↑ The Jerome Biblical Commentary, vol. 1, p. 460, says of the second episode, "Although once an independent story, in its present form it is edited to follow the preceding tale;"
↑ Robert Doran writes, "The links between all the episodes in both versions are so pervasive that the narrative must be seen to be a whole. Such stories, of course, could theoretically have existed independently, but there is no evidence that they did." (Harper's Bible Commentary, p. 868). ↑ In the Greek version that has survived, the verb form parelaben is a diagnostic Aramaism, reflecting Aramaic qabbel which here does not mean "receive" but "succeed to the Throne" (F. Zimmermann, "Bel and the Dragon" Vetus Testamentum 8.4 (October 1958), p 440. ↑ Westlake, Donald E. (1998). "The Locked Room". Murderous Schemes: An Anthology of Classic Detective Stories. Oxford University Press. p. 7. ↑ Zimmermann 1958:438f, note 1 compares A. Neubauer, Book of Tobit (Oxford) 1878:43. ↑ Zimmermann 1958:439, note 2 attests the Talmudic tractate Nedarim, ed. Krotoschin, (1866) 37d. ↑ Zimmermann 1958:439 note 3 attests Spiegel, Iranische Altertümer II.293 and Theodor Nöldeke, Beiträge zur geschichte Alexanderromans (Vienna) 1890:22. ↑ Jewish Encyclopedia, under "Bel and the dragon"; Encyclopaedia Biblica under "Daniel"; Zimmermann 1958. Levine, Amy-Jill 2010. Commentary on "Bel and the Dragon" in Coogan, Michael D. The New Oxford Annotated Bible (fourth edition). New York: Oxford University Press. Wikimedia Commons has media related to History of Bel and the Dragon. "Bel and the Dragon". Jewish Encyclopedia. 2. pp. 650–1. Retrieved 6 August 2015.